Taking good care of our environment by cutting down on power consumption is something everybody can agree on is a necessity in order save Mother Earth. However most of us do little to actually cut down on our power consumption. We are too comfortable with our high-power-consumtion way of living. What if we could keep on spending the amount of electricity we do today and still save Mother Earth? Would that not be great? What if we became so good at utilizing alternative energy sources so that we could keep up our way of life? It sounds as an Utopia, and for the time being it is. The big problem with alternative energy sources is their reliability. Wind power is only available when the wind blows. Solar power is only available on a sunny day. Storing energy for a cloudy day involves energy conversion which equals losses, and should we build facilities big enough to accomodate the big energy grid they would be enormous. It may sound like a daunting task but in fact all the information to build such intelligent devices is already available on the grid today. All we need is for the appliance manufacturer and consumers to embrace the idea! Let me explain. These can all be seen as one large generator. One big spinning mass with rotational intertia. 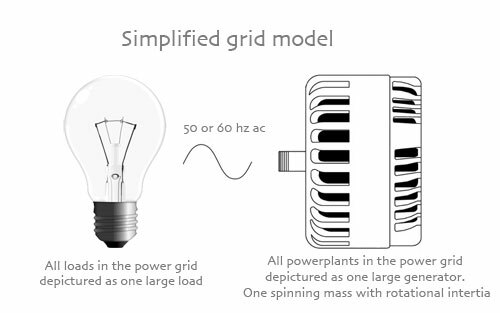 All power consumption devices can be seen as one large load. One large brake that tries to stop the spinning mass. A fine balance between generation and load is maintained. 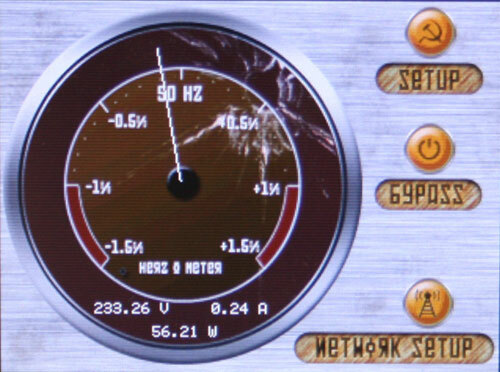 As our grid dependant on location is either 50 or 60 hz ac, this balance can be monitored directly from the ac frequency. When more power is used than what is generated, the big combined spinning mass of all the power generating devices will be slown down. The result is that the net frequency in your wall socket will drop by a minute amount. Today this is monitored on the traditional powerplants, as they are the power production facilities that can respond fastest to such changes. The response is to burn more coal, natural gas, nuclear fuel and to further pollute Mother Earth. If you measure the ac frequency in your wall socket to be 49.9 hz where it shoud be 50.0 hz it means that the grid is under extremely heavy load. That in fact is close to the limit where you can expect a blackout to occur. Often a blackout is the result of a much needed reduction in the grid load to maintain the frequency. By implementing a simple monitoring circuit in suitable devices as mentioned above, it is possible to monitor the net frequency and help the power generating facilities to balance the power consumption to meet the production. The result is that the coal, natural gas and nuclear plants does not have to increase the fuel consumption when the wind suddenly stops to blow or a could pass by the solar plants.Instead it is the power consuming devices that meet the production. 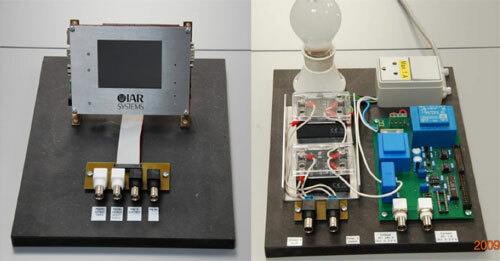 A prototype of such a monitoring system has been designed, built, tested and shown good results. The prototype is based on an Olimex LPC-2478-STK development board and runs on an ARM7 processor. The prototype use a color touch screen as user interface and the grid status can be monitored on an embedded webserver based on the micro IP protocol. This of course is very much overkill for the task at hand but that is what happens when a nerd gets his hands on a nice development board. The monitoring and control job can and should when commercially applied be performed by the smallest of microcontrollers to minimize the power consumption of the control circuit itself. What good is it to implement such a system if the control task consumes more power than what is saved by by shutting devices down? click to enlarge...	On the picture above the development board can be seen to the left. On the right hand side is the analog measurement and control circuitry which is basically an inductive non-contact voltage probe and a series of solid state relays to which appliance can be connected. The graphical user interface of the system can be seen on the picture below. Being the kind of nerd that absolutely dig oldskool and obsolete russian technology I simply had to give the userinterface that special look. The monitoring system is very sensitive. I have been able to verify deviations down to 0.05% on the grid frequency, and the system is running completely stable, turning off the light bulb you can see on the picture of the analog board in response to indications of high load on the grid. Besides describing the idea of green energy consumption in more details, the report also describes how you control a resistive touch screen, how you interface to a color LCD, and how you implement the micro IP protocol. I hope you will pick up some small tips inthere for yourself.